Daffin and Regina captured my attention while I was reading Bowman's last book, A Duke Like No Other. By the time I finished that book, I immediately went searching to find out if their story would be the next to be told and was thrilled to discover it was. I'm happy to report that it more than lived up to my expectations. These are two characters I had no trouble pulling for. They're both likable, honorable, and despite being of different social classes, have a great deal in common. Their physical attraction is clearly evident though it's the friendship that forms between them that deepens the strength of their growing emotional bond. I love that in addition to falling in love they genuinely like each other. I enjoyed how Bowman gradually unveiled facets of their characters through their thoughts, actions, and interactions. I loved the banter between these two. There's plenty of humor, emotion, and action in this tale. I like a blend of mystery and romance and Bowman is an author who crafts this mix well. The mystery in this book is one that keeps the story moving forward and kept me guessing through most of the book. My only disappointment in regards to the mystery was that the person behind the threats wasn't made to pay for their actions. Though I understand the logic behind the author's decision, I really wanted justice for a character in whom my emotions were invested. Perhaps there will be an update in a future book? 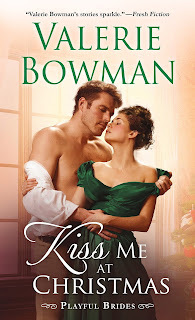 If you're looking for a fast-paced historical romance with likable characters, humor, emotion, sensual chemistry, and a mystery that helps open our hero and heroine's eyes to the love that's within their grasp, all wrapped up in a festive happy ending, pick up a copy of Kiss Me at Christmas for your holiday reading. Oh, I hoped that Valerie would write a story about Regina and Daffin. This sounds absolutely delicious. I have this on my "wish list". This book is on my Christmas TBR stack waiting for me. Sounds like a wonderful read. Thanks for the review PJ.